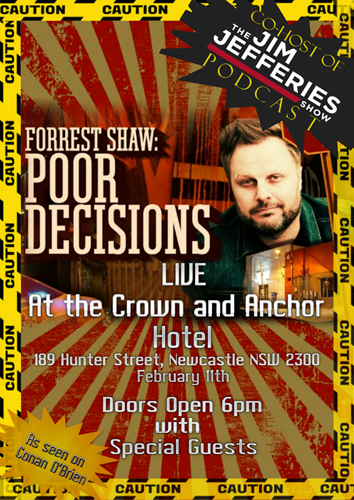 For ONE NIGHT ONLY, comedian FORREST SHAW (U.S) will take the stage in Newcastle, at the fabulous Crown and Anchor Hotel, hosted by Nightrain T.V's Lenny Jones, with a gaggle of local comics including Brian Gurr, Elliott Stewart, Bill Makin (Can) and James Conners for a night of sidesplitting stand-up comedy. Forrest Shaw is a stand up comedian and writer (The Jim Jefferies Show). His stand-up has been featured on Conan and Live at Gotham. As an actor he has appeared on FX (Legit), Comedy Central (The Jim Jefferies Show), and Animal Planet (Swamp Wars). His album Mister Grizzly, recorded with Comedy Records, can be heard on Sirius/XM Satellite radio, Pandora, and Spotify. He is co-host of The Jim Jefferies Show Podcast. Forrest is also co-writer (and lead actor) of the award-winning web series, Labor Days. He has also been featured in numerous festivals such as Comedy Central's South Beach Comedy Festival, Bridgetown, the Boston Comedy Festival, Comedy Central's Clusterfest, and the Moontower Comedy Festival. Forrest became a stand up comic after a decade of life as a marine biologist. On stage he opens up about his gambling addiction, struggles with health, and his life growing up in Miami raised by his single hippie mother. Forrest delivers his jokes with a unique perspective on life as a cynical critic of our shortcomings as a species. Also, he likes cats.